Can you tell me how I can get something like this: http://www.soft-gems.net/images/stories/screen-shots/Helium2.gif ? 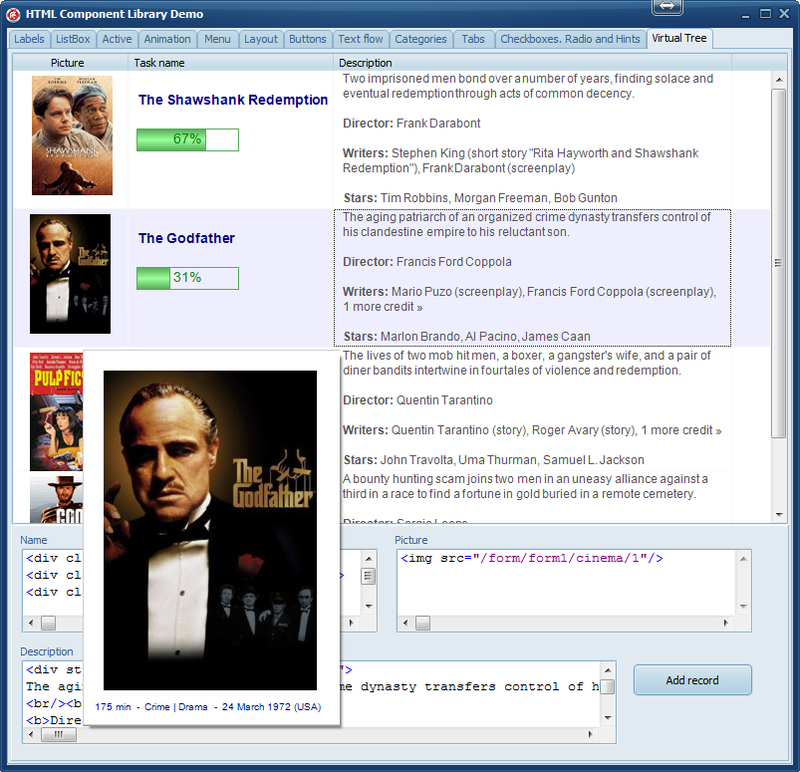 HTML Component Library contains VTV descendants that allows to use HTML in cells. Content can be even interactive (there are two components - with static and interactive content). You can also achieve something very similar by using TDBCtrlGrid and dropping components on it. with that one. I use this component sometimes but I don't know that one. But afaik there's a way to include other components into some item. You're probably right. Looking at it a bit more the link supplied isn't part of the VT screenshots either on soft-gems or jam-software, nor is it in the example demos. Looking at the helium2 website its not in their screenshots but they do have a lot of graphics displays in their product. Depending on the amount of data I'd suggest looking at one of the advanced DBGrids. From memory when I was researching a grid to use I'd look at NextGrid first. Easier to use than VT for starters. Yiu can get very near wirg DBCtrlGrid as well. IIRC, there was an 'Advanced' demo that showed the kind of features you mention. Delphi and, IIRC, 1 (or 2) for Lazarus. it is only good news. Current stable version seems to be 6.70 with a V7.0 in the works.